Chrichton's World: Review Lethal Weapon 2 (1989): How sequels should be! Review Lethal Weapon 2 (1989): How sequels should be! 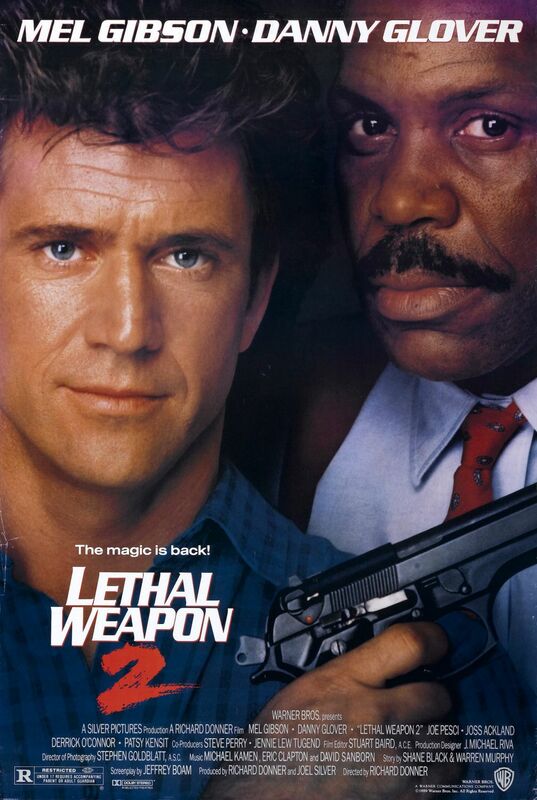 Lethal Weapon 2 is a continuation of the adventures of Martin Riggs (Mel Gibson) and Roger Murtaugh (Danny Glover). They have become real buddies and Riggs is part of Murtaugh's family as he feels at home there. It's nice to see Riggs so upbeat and positive. Does that make him less crazy? Not quite but that is very good for us since you can't quite predict what he will do next. But in this sequel there is another character added to the franchise who will make events a little more interesting. The one thing you might notice immediately compared to the original is that this sequel is far less serious. It has some dark and dramatic moments for sure but overall the tone is more light hearted. There is a lot of comic relief and one of the persons to provide that is Joe Pesci as Leo Getz. He is a very loveable low life but is very much is an annoyance to Riggs and Murtaugh. They are required to babysit him in order to give them a break from the big drug case they are working on that at first is more than they bargained for. Enter the main villains of the story. A group of South Africans diplomats during the Apartheid who basically are the most apprehensible scum of this planet. Perhaps they are portrayed a little too stereotypical and too evil for convenience sake. However they do trigger some deep rooted emotions in relationship to the characters and their friends and loved ones. Thus making the action and events very exciting and cathartic. A romance is also thrown in there which seemed a bit rushed. Rika and Riggs have an instant attraction and it doesn't take long for them to take their relationship a few steps further. I understood that this was mostly done to show and demonstrate that Riggs finally has moved on. But then one little plot twists that comes out of nowhere puts a little dent into that tale. A bit too heavy handed and illogical. But again a plot mechanic that will emote with you that makes the action more intense. In hindsight Lethal Weapon 2 does take both Riggs and Murtaugh to places where they never should have been in the first place. They are crossing lines and far less sticklers to the rules. It does make the film a lot more enjoyable and fun but also a little less realistic. The original already was over the top with it's violence but this sequel easily goes beyond that and sometimes just throws convention and morals out of the door. Overall Lethal Weapon 2 builds on what is established in the original and gives us enough fresh elements to make it compelling and entertaining with multiple viewings.